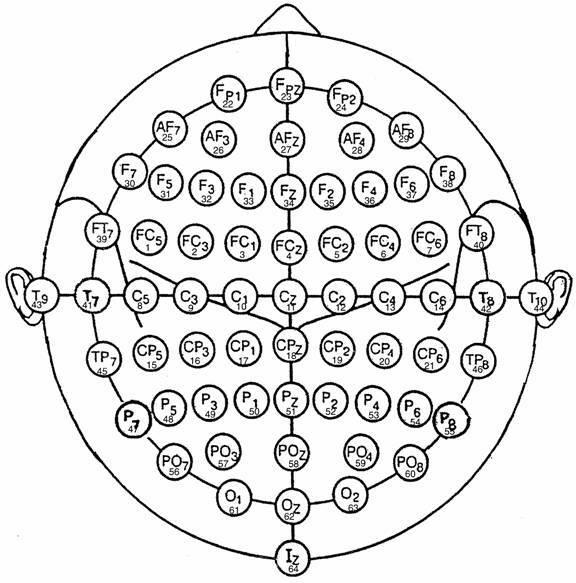 ����������� This dataset represents a complete record of P300 evoked potentials recorded with BCI2000 using a paradigm described by Donchin et al., 2000, and originally by Farwell and Donchin, 1988. In these experiments, a user focused on one out of 36 different characters. The objective in this contest is to predict the correct characters in one of the three provided sessions. The user was presented with a 6 by 6 matrix of characters (see Figure 1). The user�s task was to focus attention on characters in a word that was prescribed by the investigator (i.e., one character at a time). All rows and columns of this matrix were successively and randomly intensified at a rate of 5.7Hz. Two out of 12 intensifications of rows or columns contained the desired character (i.e., one particular row and one particular column). The responses evoked by these infrequent stimuli (i.e., the 2 out of 12 stimuli that did contain the desired character) are different from those evoked by the stimuli that did not contain the desired character and they are similar to the P300 responses previously reported (Farwell and Donchin, 1988, Donchin et al., 2000). Figure 1: This figure illustrates the user display for this paradigm. In this example, the user�s task is to spell the word �SEND� (one character at a time).� For each character, all rows and columns in the matrix were intensified a number of times (e.g., the third row in this example) as described in the text. ����������� We collected signals (digitized at 240Hz) from one subject in three sessions. Each session consisted of a number of runs. Each run is stored in one Matlab file (e.g., file �AAS011R06.mat� for session 11, run 6).� In each run, the subject focused attention on a series of characters (see table for the target word for each run in session 10 and 11). 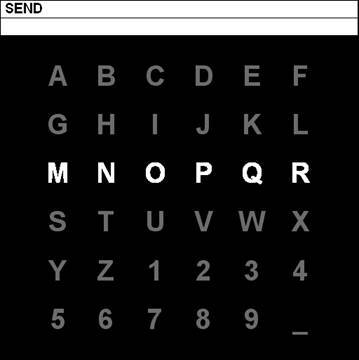 For each character, user display was as follows: the matrix was displayed for a 2.5 s period, and during this time each character had the same intensity (i.e., the matrix was blank). Subsequently, each row and column in the matrix was randomly intensified for 100ms (i.e., resulting in 12 different stimuli � 6 rows and 6 columns). (After intensification of a row/column, the matrix was blank for 75ms. )� Row/column intensifications were block randomized in blocks of 12. Sets of 12 intensifications were repeated 15 times for each character (i.e., any specific row/column was intensified 15 times and thus there were 180 total intensifications for each character).� Each sequence of 15 sets of intensifications was followed by a 2.5 s period, and during this time the matrix was blank.� This period informed the user that this character was completed and to focus on the next character in the word that was displayed on the top of the screen (the current character was shown in parentheses). and channel assignment numbers as used in our experiments. ����������������������������������� See Figure 4 for details. � Find all signal samples that hold the period after one intensification. � Determine the StimulusCode for this period. � Accumulate associate signal samples in separate buffers, one for each stimulus. Please note that responses to the stimuli overlap with subsequent trials. In other words, the rate of presentation is faster than the delay of the responses. Thus, signals need to be extracted that overlap with the presentation of the next row/column. Figure 3: This figure illustrates the content of each Matlab file. Channel numbers (e.g., columns in the variable signal (i.e., a matrix of total # samples x 64 channels) correspond to channel numbers in Figure 2.� See text for a description of the vectors runnr, trialnr, and sample. Additional variables encode intensification variables (refer to text and Figure 4 for details). StimulusCode to different row/column intensifications. This program compares responses to target vs. non-target stimuli (i.e., stimuli that did/did not contain the desired character) for session 10, run 01. Please note that in this example, Figures 4 and 5 are meaningless since data for all three characters are analyzed !! This program uses a very simple classifier to predict the first character of the word in session 12, run 01. It uses one sample at Cz and 310ms after intensification for classification. It determines the target character as the character with the highest amplitude (at Cz/310ms). It does this for the first character in the word in session 12, run 01. We do not specify whether the resulting character is or is not correctly predicted. Figure 5:� This figure shows a topography of values of r2 (i.e., the proportion of the signal variance that was due to whether the row/column did or did not contain the desired character), calculated for one sample at 310ms after stimulus presentation. This topography shows that there is a spatially fairly wide-spread difference at 310ms after intensification of a row/column that is different for rows/columns that did vs. ones that did not contain the desired character. Figure 6:� This figure shows the time course of the actual average signal waveforms (at Cz) and of r2 (i.e., the proportion of the signal variance that was due to whether the row/column did (oddball) or did not contain the desired character (standard)). Figure 7:� This figure shows the output of the provided script testclass.m. It shows averaged responses for each character (each character response is calculated as the average of the corresponding average row and column responses), and the character that was predicted for these data using a very simple classification procedure. focusing on in run 10 and 11. ����������� We will compare the submitted words with the actual words character by character to determine % correct (DO NOT CHEAT, e.g., by correcting words after classification).� The submission with the highest % correct wins the competition. In case competition participants are confident of their results, it would be interesting if they can produce the same results with fewer than 15 sequences of intensifications. ����������� Farwell L.A., Donchin, E. Talking off the top of your head: toward a mental prosthesis utilizing event-related brain potentials. Electroencephalography & Clinical Neurophysiology. 70(6):510-23, 1988. ����������� Donchin, E., Spencer, K.M., Wijensinghe, R. The mental prosthesis: Assessing the speed of a P300-based brain-computer interface. IEEE Trans. Rehab. Eng. 8:174-179, 2000. BCI2000 is a flexible Brain-Computer Interface research and development platform. It supports a variety of brain signals, signal processing methods, and user applications, and is available free of charge for research purposes (http://www.bci2000.org).